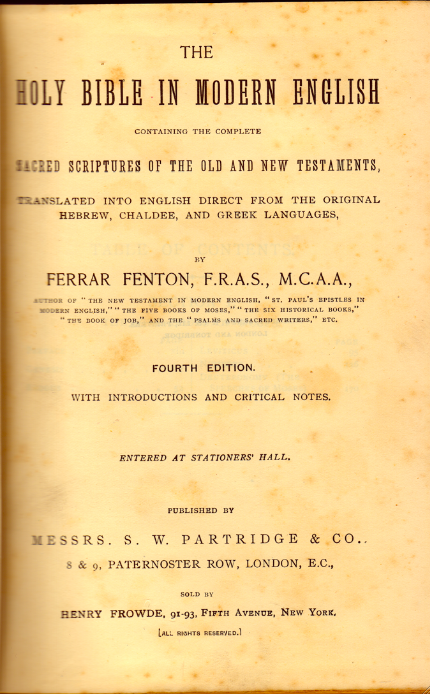 Ferrar Merricmac Fenton, (1832–1920) an English businessman, who believed that his commercial experience was a divine Preparation to fit him to be a competent translator of the Bible, finished his complete version in 1903 (parts from 1882 onwards). Though it´s today considered as quite an oddity, it was reprinted until 1944. He believed he was the only man who has ever applied real mental and literal criticism to the Sacred Scriptures and that he had discovered "the Hebrew laws of Syllabic verse": His Gen. 1:1 rendering »By Periods God created that which produced the Solar Systems…« (Gen 1:1, 4th ed. only) became famous in its genre. It is a curious work in several ways, containing peculiarities such as the use of e. g. ´Ever–living´ for ´the Lord`. 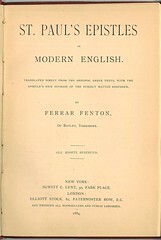 Though its influence has been but slight, it should be noted as one of the pioneer modern translations made by a single–hand. 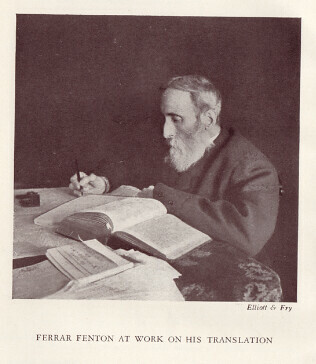 (Put together from various sources) The Photo below shows Ferrar Fenton "at work on his translation" and is presented as such in the 1935 edition. 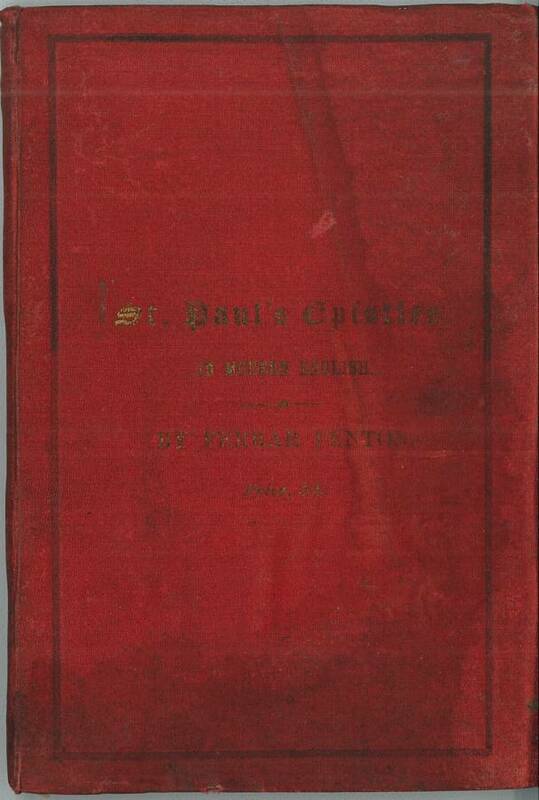 Title: St. Paul's Epistles in Modern English. 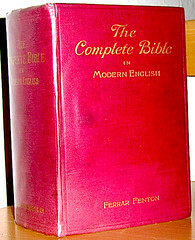 Translated direct from the original Greek texts, with the Apostle's own division of the subject matter restored. 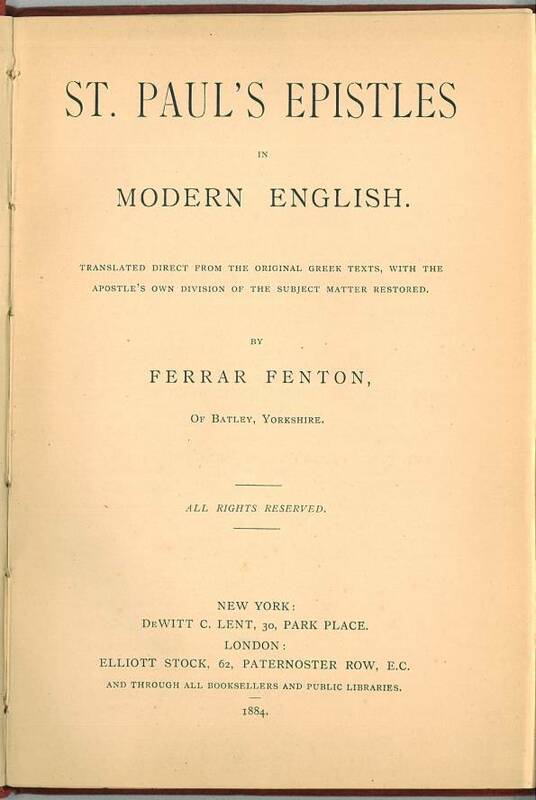 By Ferrar Fenton, of Batley, Yorkshire. All Rights Reserved. 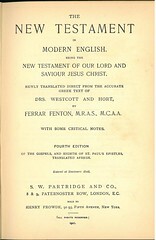 Title: The New Testament in Modern English. Being the New Testament of Our Lord and Saviour Jesus Christ. Newly Translated direct from the accurate Greek Text of Drs. 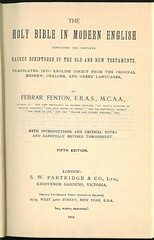 Westcott and Hort, by Ferrar Fenton, M.R.A.S., Member of the Cambrian Archæological Association. With some critical notes. 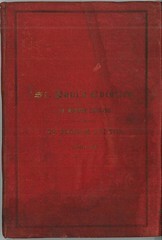 Second Edition of the Gospels, and Sixth of St. Paul's Epistles, translated afresh. 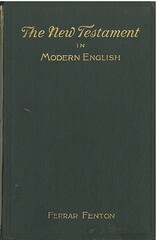 Copyrighted in England and United States of America. Entered at Stationers' Hall. References: Chamberlin 34-2, Herbert 2098, Taliaferro CN00132. Taliaferro-EELBV 7680.105. 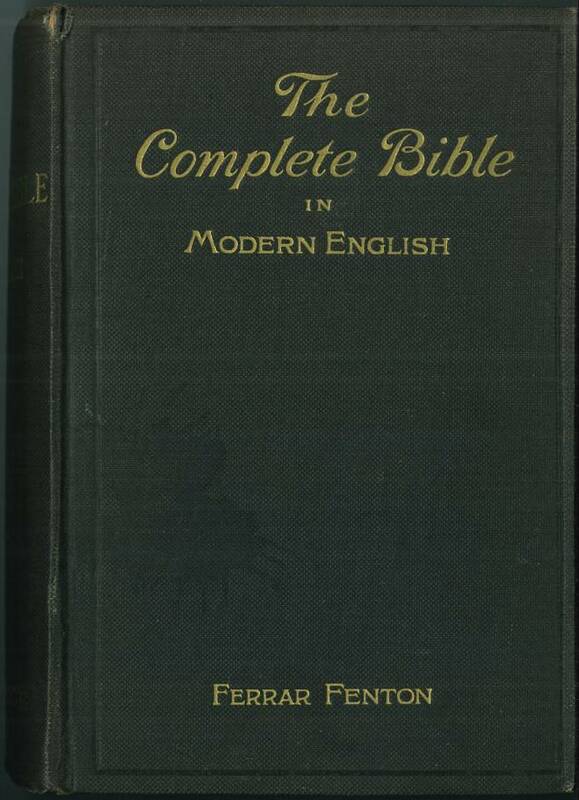 Title: The New Testament in Modern English. Being the New Testament of Our Lord and Saviour Jesus Christ. 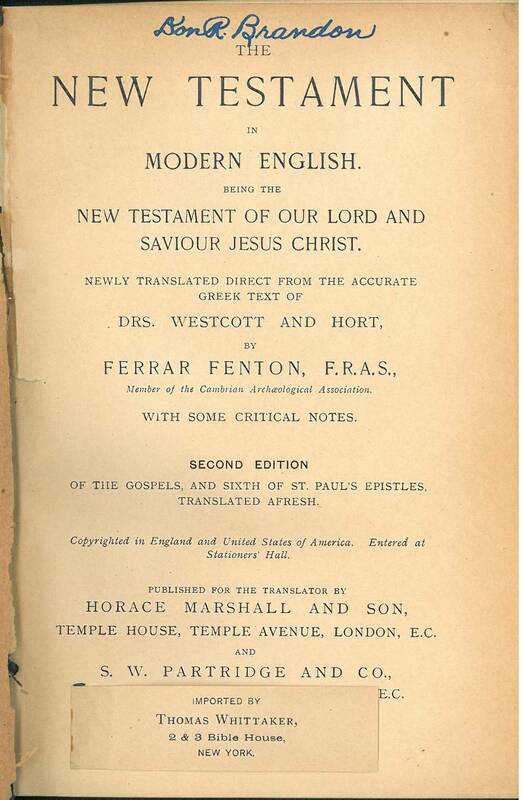 Newly Translated direct from the accurate Greek Text of Drs. 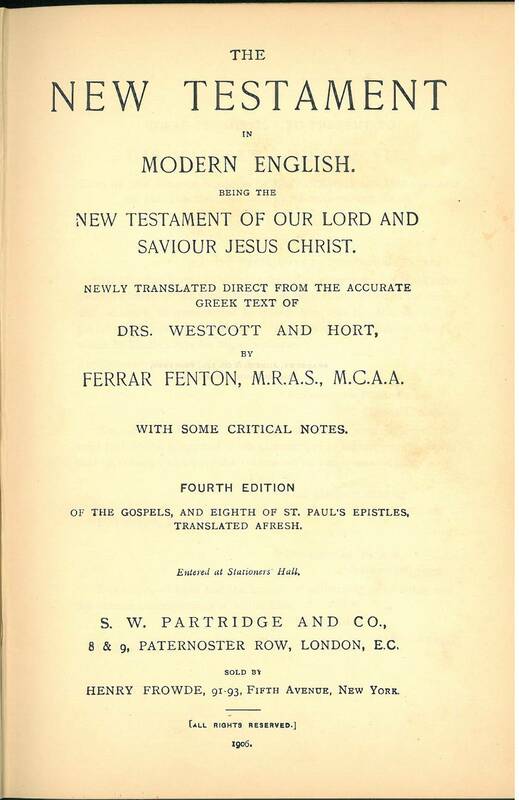 Westcott and Hort, by Ferrar Fenton, M.R.A.S., M.C.A.A. with some critical notes. 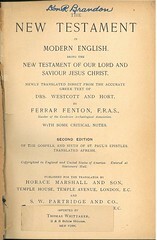 Fourth Edition of the Gospels, and Eighth of St. Paul's Epistles, translated afresh. Entered at Stationers Hall. 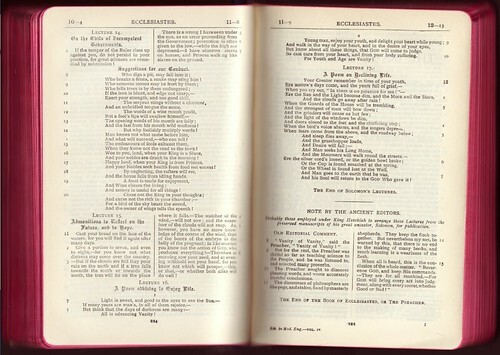 Facsimile: Google books has a facsimile of the 1905 edition here. 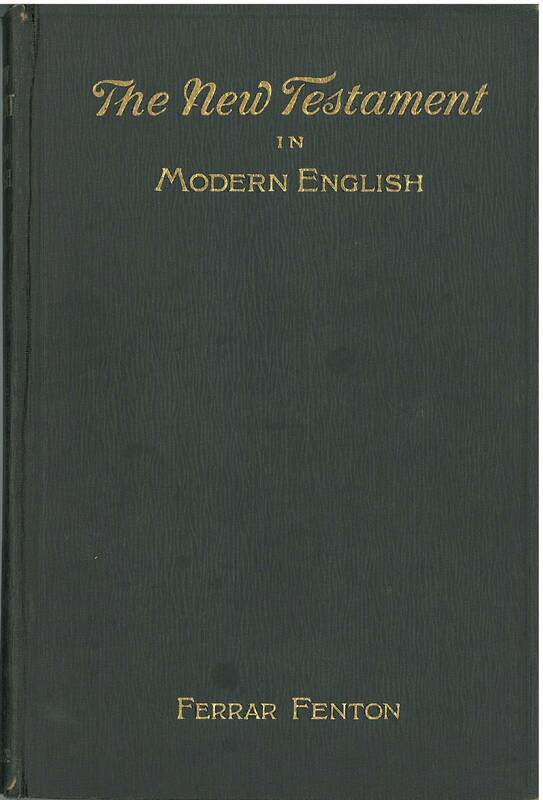 References: Chamberlin p. 34-2, Herbert see 2098, Taliaferro CN00132, Taliaferro-EELBV 7680.105. 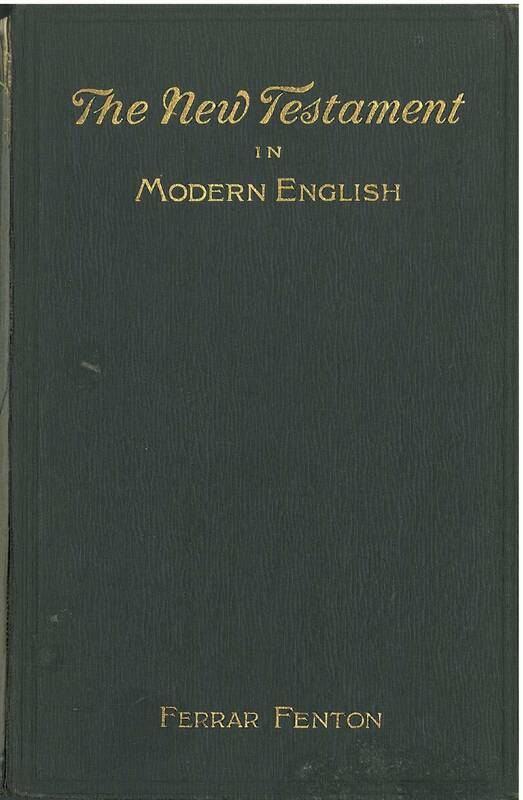 Publisher: London E. C., England (U.K.): Messrs. S. W. Partridge & Co. 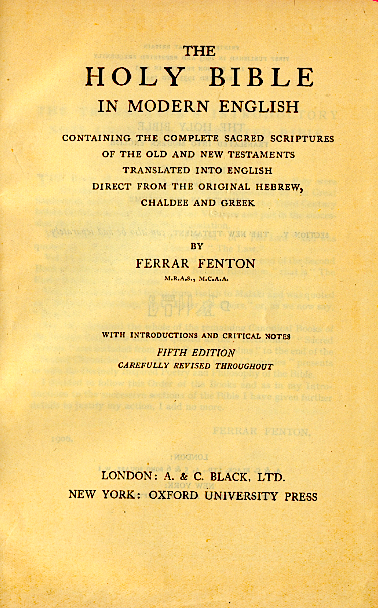 Title: The Holy Bible in Modern English Containing the Complete Sacred Scriptures of the Old and New Testaments Translated into English Direct From the Original Hebrew, Chaldee and Greek by Ferrar Fenton, F.R.A.S., M.C.A.A. References: Chamberlin 34-2; Herbert 2108, 2116, 2117, 2128, 2129, Taliaferro CN00132, Taliaferro-EELBV 7680.130. 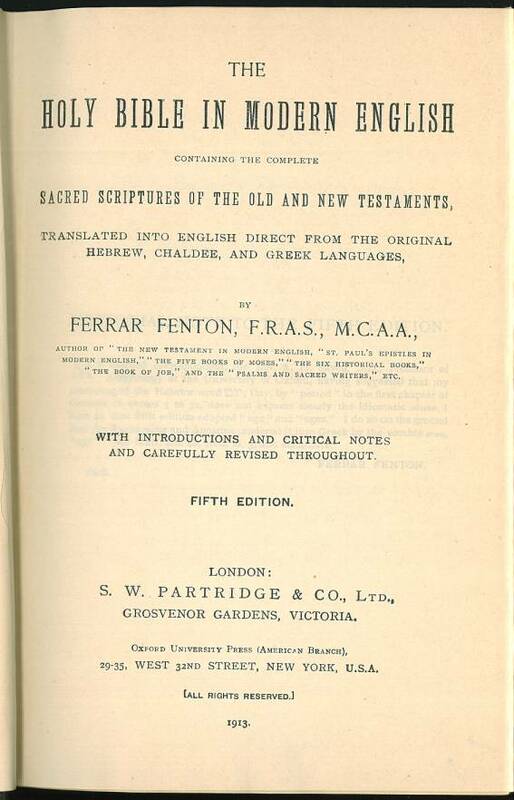 Comments: This particular edition appears to be the four separate portions of the Old Testament (Herbert 2108, 2116, 2117, and 2129) bound together in one volume with the New Testament. 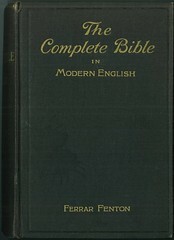 Contents: PB in five sections according to the Hebrew canon • Frontispiece with Photo of Author (see above) • The Translator´s Introductory Note upon the Complete Bible (1906) • Dedication • Introductory Note the the Complete Bible in Modern English (1910). 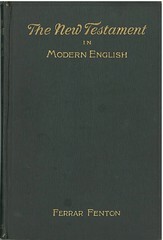 Note to my Inquiring Friends / Explanatory Note (London, 1910) • Editorial Note to the 5th Ed. (1906) • Contents. Open pages of 1935 / 5° resp. 10° ed.